This fictional Hebblethwaite appears in the operetta Ages Ago written by W S Gilbert with music by Frederic Clay. It was first performed at the Gallery of Illustration on November 22nd, 1869. This was a little theatre in Regent Street, where a small cast performed intimate musical entertainments. 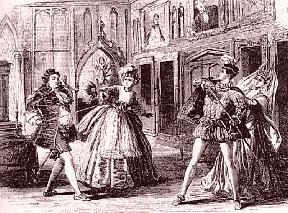 It was at the rehearsal for Ages Ago that Gilbert first met Sullivan, to whom the operetta is dedicated. The scene is the Picture Gallery in Glen-Cockaleekie Castle which has been deserted for almost a century, its last inhabitants leaving no heir. Every hundred years, however, in fulfillment of a past mortgage made with the devil, the title deeds mysteriously appear and a new rightful owner is found. Recently, Ebenezar Tare has started squatting in the castle. Columbus Hebblethwaite is his unwelcome visitor - his niece Rosa's poor, but honest, suitor. That night, when the inhabitants have gone to bed, the portraits of the past owners of the castle come to life, step out of their frames, and set up a series of complex relationships with each other. They then fulfill their duty and leave the title deeds to the castle, declaring Columbus Hebblethwaite to be their lineal descendent, before returning to their frames for another century. The present inhabitants emerge for breakfast and find the title deeds. Columbus strikes a good bargain - he allows Ebenezar to continue living in the castle if he consents to his marriage to Rosa. The old man relunctantly agrees.